Islamabad, Pakistan (CNN) -- Pakistani officials Sunday rejected allegations that their country's powerful intelligence agency still supports the Taliban and other Afghan insurgents after a paper from a Harvard academic accused the agency of continued links to the rebels. The powerful Inter-Services Intelligence agency does not "actually control the Afghan insurgency" and does not have "the ability to bring it to an end," Matt Waldman argues in a paper for the London School of Economics. But the ISI provides "sanctuary, and very substantial financial, military and logistical support to the insurgency," giving it "strong strategic and operational influence -- reinforced by coercion," according to his report, which cites Taliban commanders among its sources. The ISI is widely thought to have played a key role in creating the Afghan Taliban during the 1990s, but Pakistan officially denies supporting them now. Maj. Gen. Athar Abbas, spokesman for the Pakistani military, called the claim "rubbish" on Sunday and said Waldman's report "does not have a credible source or authenticity." "At best, it is speculative and only gives open sources without naming [them]," Abbas told CNN. "So, therefore, this kind of report requires a treatment which it really deserves. We are not going to formally respond to this, but we reject these allegations and accusation. If there are hard evidence, we would like for them to be brought out and we would be able to respond accurately." And Farahnaz Ispahani, a spokeswoman for President Asif Ali Zardari, called Waldman's report "one-sided" and dismissed what she called its "wild accusations." "If Mr. Waldman had been a seasoned academic, he would have conducted interviews in Pakistan itself to balance his so-called research report," Ispahani said. "The Pakistani government and its military have been performing an outstanding service to the world community as well as the region in its fight against militancy and extremism, and we can count the dead we have sacrificed in the thousands." Waldman's report is titled, "The Sun in the Sky: The relationship between Pakistan's ISI and Afghan insurgents." He based his conclusions on interviews with nine insurgent field commanders in three regions of Afghanistan, plus former Taliban officials, tribal leaders, politicians, experts and diplomats. The title comes from Taliban commanders' claims that their relationship with Pakistani intelligence is "as clear as the sun in the sky." Waldman concluded that that Pakistan "continues to give extensive support to the insurgency in terms of funding, munitions and supplies." But Abbas dismissed the unnamed sources, calling the report "rubbish." "Has he named any Taliban commanders in this, has he named any officials?" Abbas said. "So, therefore, if it doesn't have any specific source, which is not willing to disclose a name, it just becomes one of those reports that keep appearing. It is a serious allegation, but unless it has a credible evidence to support it or substantiate the report, only then it warrants a serious consideration for response." The ISI works not only with the Taliban, but also with the armed Haqqani network, led by Jalaluddin Haqqani and his son Sirajuddin, Waldman wrote. The Haqqani network sometimes cooperates with the Taliban and sometimes fights it. The Taliban members interviewed believe that the ISI has a heavy influence on their leadership, which some of them said amounts to control, according to the report. One of the southern commanders claimed: "If anyone rejects that the ISI backs or controls the Taliban, he has a mental problem ... all our plans and strategy are made in Pakistan and step by step it is brought to us, for military operations or other activities," the report says. And southern Taliban commanders all complained of heavy ISI involvement, which they blamed for some attacks on civilians. "One southern commander described their predicament as follows: 'Another group of Taliban is directly supported by the ISI. They will never stop fighting in the country; they want to destroy the government and bring chaos. Behind all the attacks on ... NGOs, schools, teachers, doctors, this is Pakistan. 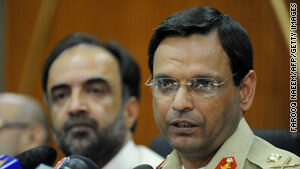 We cannot deny that it is Taliban; but there are Pakistan controlled groups among us. They want destabilisation ...,' " the report says. Waldman's report comes two months after a U.N. report on the assassination of former Prime Minister Benazir Bhutto in 2007 -- an attack blamed on Pakistani Taliban leaders -- found that intelligence agencies hindered the subsequent investigation. The report concluded that the "pervasive reach" of Pakistan's intelligence agencies left police "unsure of how vigorously they ought to pursue actions, which they knew, as professionals, they should have taken," the report states.